We have recently won a laundry contract with The Royal Hospital Chelsea which is the home of The Chelsea Pensioners. 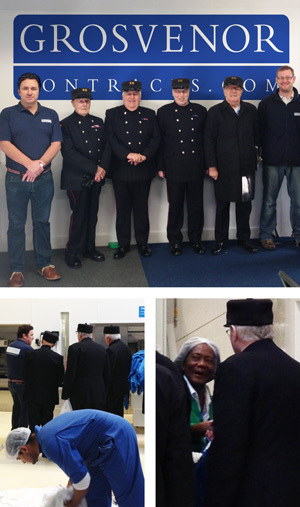 We are honoured to be servicing those who served our country and equally honoured when we were paid a visit by some of the Pensioners last December. The Royal Hospital Chelsea was founded by King Charles II in 1682 to care for those ‘broken by age or war’. Christopher Wren was commissioned to design and erect the building. Work was finally completed In 1692 and the first Chelsea Pensioners were admitted in February, by the end of March the full complement of 476 were in residence. Since then the hospital has undergone many refurbishments and additions. Designed by Sir Quinlan Terry the Margaret Thatcher Infirmary was opened in March 2009, this is a state of the art care home and hospice. Grosvenor Contracts supplied and installed full healthcare blinds and curtains throughout. By 2015 all rooms will be upgraded to new ensuite rooms with a study. Find out more about The Royal Hospital Chelsea.